Esophageal motility problems can occur in patients with progressive systemic sclerosis (scleroderma) because the submucosa becomes fibrotic. This occurs most often in the esophagus, but may also be seen elsewhere in the GI tract. 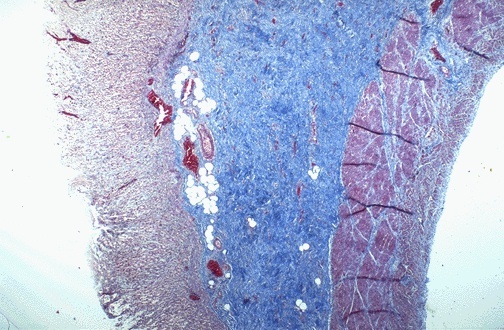 Here in the stomach, a trichrome stain demonstrates a blue submucosa because of the extensive fibrosis.